Random Thoughts: Pakistan: The world's most dangerous place ??? Pakistan: The world's most dangerous place ??? Pakistan: The world's most dangerous place? I was simply shocked to find this as the cover article of a reputed international magazine. I simply do not understand when will the International media refrain from politicizing issues and act unbiased in news reporting and spreading information. I have had arguments with many journalist already in the issue, who seem to be unfazed with the implications their reports carry and are simply blinded off by the political agenda they carry and then the might of 'rating systems'. 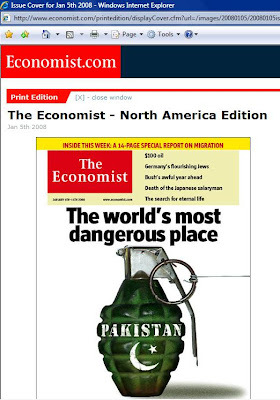 And now the Economist has done nothing but added fire to the already burning Pakistan. [click here to read the full article] Reporting that "it is not only that the country's lawless frontier lands provide a refuge for al-Qaeda and Osama bin Laden, and that its jihad academies train suicide-bombers with global reach", this international magazine has done nothing more but given another reason to the international community to interfere in the running of the country and who knows, make another Iraq. Already the world is grappling with fact of various Central Asian countries moving away towards instability and then democracy being unsuccessfully imposed upon them, with the failed examples of Iraq and Afghanistan putting huge question marks on the credibility of the exercise being undertaken at the UN headquarters. After all what do the people on the hot seat thing they can achieve by removing the people governing their people and imposing a puppet government on the masses? Nothing can be achieved by making the people feel that they are not competent enough to manage themselves and make them realize through external supervision of their activities. The colonial era, the revolutions and their aftermath are only indicators of this potent problem, which the leaders of today failing to recognize the implications involved will again poke their noses in these intricate issues. Why has Britain not remained not so politically important centre today than it was once? Because it embarked too much on external affairs management than giving priority to making its own place a better place to live on. Why is US more concerned about WMD than its own economy? Why is China exporting almost of the production that it achieves? All because external returns are more lucrative and more glory for the leaders who chase those futile dreams. But the fact remains that more you poke your nose in another man's affairs, the more are the chances of having a sore face. History is replete with illustrations to it and I don't want to do the honour of pointing it out to those ill-understood folks. And then the final nail is cast in the coffin with the press gets involved. Though its objective should be public-opinion-generating, it is more inclined now to public-opinion-swaying. Filling the news pieces with not just sensitive information, which they should actually do, but instead superimposing their their own political ideologies and agenda and portraying the end of the world if some action is not taken. No wonder all these magazines and journals are viewed as being right or left winged and their content taken care of accordingly. I would have loved the press coming out with the solutions they think would be wise for a politically instable nations as Pakistan is now and keep the general public informed about the options open to them, both in the country as well as internationally, such as positive action could be taken upon them. But what do we see, infinite conjunctures and surmises over the future of a doomed nation, as the news piece portrays it.